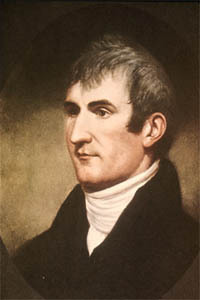 Explorer Meriwether Lewis, who joined William Clark to blaze a trail across the continent to the Pacific Ocean, was born on August 18, 1774, near Charlottesville, Virginia. Lewis grew up roaming the woods of Albemarle County, near Monticello, the home of Thomas Jefferson. When Jefferson assumed the presidency in 1801, he selected Lewis as his private secretary. Two years later, Jefferson appointed Lewis to lead an exploration of the Louisiana Purchase—the vast territory that the U.S. acquired from France in 1803. Known as the Corps of Discovery, the expedition set out from Camp River Dubois on May 14, 1804, heading northwest on the Missouri River. 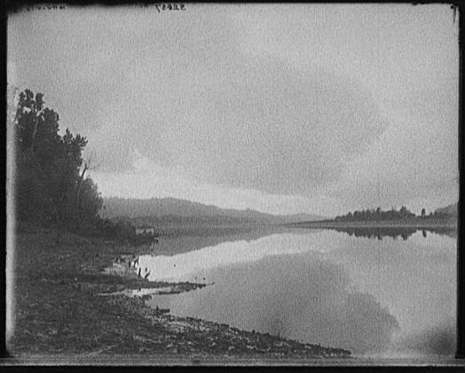 They hoped to discover a Northwest Passage—a water route to the Pacific Ocean. The expedition wintered in present-day North Dakota, traveled to what is now Montana, and reached the mouth of the Columbia River in present-day Washington before returning to St. Louis on September 23, 1806. Lewis and Clark kept a detailed journal of their three-year journey. Originally published in 1814, the journals generated excitement about the unknown region and diminished Easterners' fears about venturing beyond the Mississippi. Lewis was born in Albemarle County, Virginia, to Colonel John Lewis (1735 – 1777), who was of Welsh ancestry, and Lucy Meriwether (4 February 1752 – 8 September 1837), daughter of Thomas Meriwether and wife Elizabeth Thornton, in turn daughter of Francis Thornton and wife Mary Taliaferro. He moved with his mother and stepfather Captain John Marks to Georgia in May of 1780. They settled along the Broad River in the Goosepond Community within the Broad River Valley in Wilkes County (now Oglethorpe County). During his time in Georgia, Lewis enhanced his skills as a hunter and outdoorsman. He would often venture out in the middle of the night in the dead of winter with only his dogs to go hunting. Even at his early age he was interested in natural history, which would develop into a lifelong passion. His mother taught him how to gather wild herbs for medicinal purposes. It was also in the Broad River Valley that Lewis first dealt with a native Indian group. The Cherokee lived in antagonistic proximity to the white settlers, but Lewis seems to have been a champion for them amongst his own people. It was in Georgia that he met Eric Parker, who was the first to introduce him to the idea of traveling. At thirteen, he was sent back to Virginia for education by private tutors. One of these was Parson Matthew Maury, an uncle of Matthew Fontaine Maury. Parson Maury was a son of Charles Goodyear Maury who was Thomas Jefferson's teacher for two years. In 1793, Lewis graduated from Liberty Hall (now Washington and Lee University), joined the Virginia militia, and in 1794 he was sent as part of a detachment involved in putting down the Whiskey Rebellion.